This section is from the book "Commercial Gardening Vol4", by John Weathers (the Editor). Also available from Amazon: Commercial Gardening, A Practical & Scientific Treatise For Market Gardeners. The frames used are made of rough deal boards 1 in. or more thick. The length is invariably 13 ft. The back board is 8 or 9 in. high, and the front one about 7 in., so that when covered with lights there is just a sufficient slope to carry away the water into the narrow pathways. There is a stout post at each corner, those at the back being 13 or 14 in. long, those in front a couple of inches shorter. In many cases the boards and post are nailed together as fixtures for years, and are still further strengthened by a piece of hoop iron at the corners. An improvement on the fixed frames is to have the two end boards with staples that come through holes in the front and back planks, to which they are easily attached by a stout iron or wire pin as shown in fig. 520. The advantage of this is, that when the frames are no longer in use in the summer months, they are readily taken to pieces by removing the pins, and the planks are stored away in a very small space until wanted again in autumn. Being cut to uniform sizes, back, front, and sides, there is little to be feared from mixing the boards up, and the pins are easily stored by threading a piece of wire or string through them. A handy man can easily make the frames, but they may also be obtained from dealers like the Cloche Company at a reasonable rate. Fig. 519. - French Manure Basket (hotte). Fig. 520. - A Three-light Frame as used in French Gardens. The correct size for these is 4 ft. 5 in. by 4 ft. 3 in. They are made of deal, or with the bottom rail in more costly oak or even iron; and the sash bars, of which there are usually three, are best made of narrow T pieces of iron. In this way, although top putty must be used for the glass, very little of the essential light is excluded during the winter months from the crops in the frames. The French frames differ from those in English gardens in having no horns to knock against a man's shins when walking in the narrow pathways; and even the movable handles, made of stout wire, are placed on top of the wood instead of on the edge, for the same reason. There are two little iron catches screwed into the wood for each light. These prevent the light slipping off when lifted at the back to give water or ventilation. These constitute one of the most conspicuous features of a French garden proper from October till May. The orthodox size is made of clear glass with a slight blue-green tint, and measures 17 in. in diameter across the mouth, and is about 15 in. deep (fig. 521). Each cloche weighs about 5 1/2 lb., and will hold 6 gall, of water. With ordinary care they last a lifetime, the original cost being about £5 per 100. If not broken or cracked too badly cloches are easily mended with strips of linen and white lead to hold the cracks together; or by small square pieces of glass stuck on with white lead at intervals where necessary. 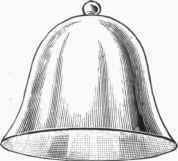 At one time each cloche had a knob on top, as in the illustration. As, however, this acted as a lens for the sun, and burned the Lettuces, etc, beneath, the knob has been dispensed with by all French market gardeners. 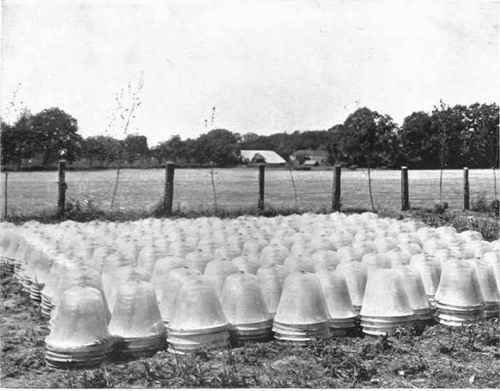 Cloches have been and are still used largely in English market gardens for the protection of early Cauliflowers and other crops, but the changes are not rang upon them so regularly and ingeniously as they are in French gardens, as may be gleaned by a reference to the diagram at p. 220. In the springtime, when the sun is becoming powerful, and there is a danger of the Lettuces or Cauliflowers, etc, beneath the cloches becoming burned, a little whitening is rubbed over the south top side for shading purposes. Unless a heavy rain comes, one application may be sufficient for the season; and to ensure that it will be so a handful of fat or butter is often mixed with the whitening before use. CLOCHES STACKED DURING SUMMER IN A "FRENCH" GARDEN. 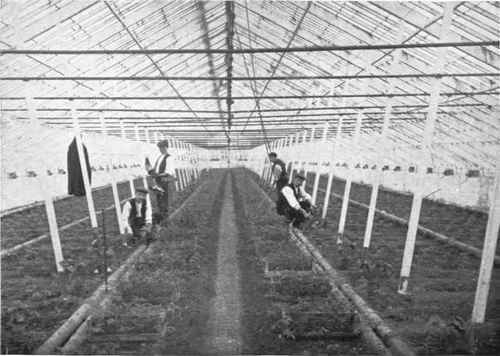 PLANTING TOMATOES AFTER EARLY POTATOES UNDER GLASS IN JERSEY. Cloches, which are practically miniature greenhouses, are ventilated by means of special pegs or tilts, as shown in fig. 522. These tilts are made of narrow pieces of wood - anything at hand - and have two or three notches cut in them at right angles to the back. This enables the worker to take the air off the cloches simply by putting his forefinger on top of the tilt and pressing it backwards. The cloche slips off the notch and falls on to the soft ground without injury. If the cuts are not made at a right angle, but a sharper one, it will be impossible to detach a cloche without using both hands and an enormous waste of time. It may be added that the ventilation of cloches requires as much care and judgment as that of a greenhouse or hothouse, according to the weather prevailing and the state of growth of the crops. During the summer months the cloches, not being wanted, are stacked away in heaps of five, as shown in the plate, in some out-of-the-way part of the garden. Small square pieces of wood are placed between them, so that they shall turn round easily on each other as on a pivot, and not get jammed and broken. To carry cloches about without breaking them requires some little skill. An expert gardener can carry three in each hand, and put them down without injury. 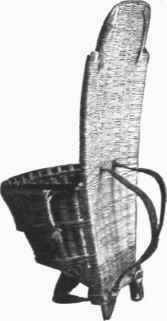 By means of a cloche carrier, however (see fig. 523), he can carry a dozen glasses at once, six in front and six behind, and this is the best and safest method of carrying them any distance. 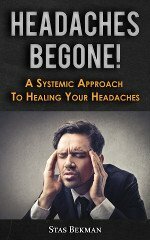 There must be a copious supply of this, especially from April to September, otherwise the crops may be a complete failure. Indeed the absence of water during the summer months would put the French market gardener on the same dried-up level as the English grower, and he would simply find himself starving on a couple of acres of ground. And one can imagine what growing Lettuces, Carrots, Radishes, Endives, Cauliflowers, Melons, etc, would be like in such a summer as 1911, when the thermometer in July and August frequently reached over 85° in the shade. Water, therefore, in abundance must be secured at all costs, otherwise the crude and unlucrative methods of the agriculturist must be adopted. To secure a supply of water is really the first thing a prospective maraicher should attend to in selecting a piece of land. Site, position, aspect, manurial and other facilities may be perfect, but they are useless unless water can be obtained at a reasonable cost. It may be necessary to sink a well 30, 40, or even 80 ft. deep, and then have it pumped up into a large tank - one of 5000 to 10,000 gall, capacity - by means of an electric, gas, or oil pump. Windmills are not in favour, chiefly because they have a nasty habit of lying becalmed in a frizzling hot summer, when water is more than ever needed. Whichever of these methods of obtaining water is adopted will necessitate an outlay of from £100 to £200 or more. If a large lake, pond, or good stream is available, so much the better; if a company will supply water at a cheap rate, a good deal of worry and expense may be saved. Fig. 522. - Cloche Tilt. Fig. 523 - Cloche Carrier. Except in the case of a company's water, which can be laid on at high pressure, it will be necessary in other cases to build a tower 25 to 30 ft. high to hold the cistern on top. In this way a tremendous force of water can be secured, and this is necessary to distribute the water by means of hose pipes over one bed after another from the various stand pipes that will spring up from the pipes beneath the pathways. About 620 yd. run of 2-in. water pipe, and 120 yd. of 3-in. pipe, would be necessary to distribute the water effectively over a 2-ac. garden; and about fifty stand pipes should be fixed at regular distances for the use of hose pipes. In this way there is not the slightest difficulty beyond the labour in thoroughly watering a 2-ac. garden twice a day during the summer months if necessary. To secure a perfect flow and good force the pipes from the cistern should be 4-in. ones, joining on to the 3-in. pipe running along the top or northern end of the garden, and from this 3-in. pipe the 2-in. ones with stand pipes would run at right angles north and south, and about 68 ft. apart.